Canadian Wildlife Federation: I'm spending a small fortune on birdseed this winter. Are there any more inexpensive alternatives? I'm spending a small fortune on birdseed this winter. Are there any more inexpensive alternatives? A. Some of the most watched and beloved of Canada’s wildlife species are the birds we see on our properties. They bring hours of enjoyment as we watch their antics, especially at our bird feeders. According to a recent study, one in four Canadians either buy bird feed or bird products and the average amount we each spend is $1,000 a year. In today’s economy where the price of everything seems to be going up, I understand that while you would still like to feed your backyard birds, you’d also like to do it at as low a cost as possible. Below are some suggestions that will hopefully allow you to spend less and still enjoy your feathered friends! 1. Spend your money on good quality seed rather than on seed mixes with lots of fillers. Mixes with fillers will result in a lot of the mix ending up on the ground, uneaten and a waste of your money. Spending money on quality seed like sunflower seeds will ensure that most of it is eaten, with little tossed on the ground. Too save even more money, you can buy seeds that are still in the shell. 2. If you are limited in the amount of seed you can put out each day, put smaller amounts out at around the same time. 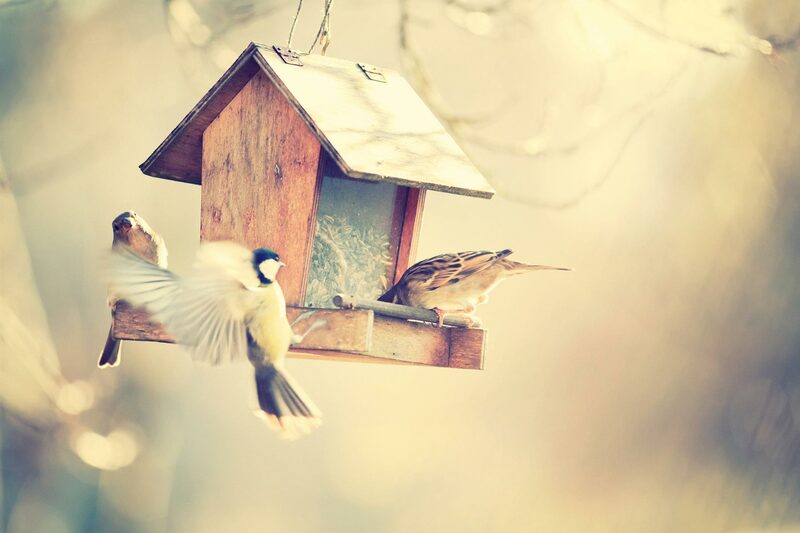 The birds will get used to when the feeders are filled and may attract a more manageable number of birds. 3. Buying in bulk often saves time and money. You’ll often get a better price per pound and won’t have to purchase it as often. 4. Just like we look through the weekly flyers to find the best price on butter, check your flyers to see if any of your local stores has bird seed on sale. If the price is right, it might be best to stock up! 5. You can make your own suet. Suet is a high energy food for many insect-eating birds like chickadees, nuthatches and woodpeckers. To make suet, purchase raw beef fat or suet from a butcher, grind it up and add in your own seeds or dried fruit. Store it in the freezer and when it’s ready, hang it outside. Just a couple of suggestions – don’t add drippings to your suet as the high salt content can be harmful to birds and if the temperatures warm up, remove the suet so it doesn’t go rancid. 6. Plant for the birds. That’s right – planting for birds is the best way to meet the needs of many species of birds throughout all the seasons. By planting a variety of different plants, you won’t only be providing seeds, you’ll also be giving them fruit, nectar and shelter. Juncos, finches and chickadees will land on seed heads in the winter from plants like Echinacea and Rudbeckia (Brown-eyed Susans). You can start out slow and grow you garden when you can. Plant a mixture of taller and shorter trees, shrubs, native flowers and grasses. Click here for more information on planting for birds. 7. While you may feel there’s no other way to get rid of that pesky bug, try to avoid the use of insecticides. Many ornithologists agree that insect-eating birds are in decline and one of the reasons for this is a decline in insects. Insect-eating birds include warblers, swallows and meadowlarks. And the good news is that by attracting insect-eating birds to your property, they might just take care of that insect problem for you.